The Red Master Cutter is designed for dirt rings and the deeper depths required by the cutting industries. The teardrop sides have been purposely cropped to avoid plowing and provide easier turning. Two inches of additional space between the two-tines bars. And two inches of depth capability have been added to this harrow frame to achieve zero to 6 inches of depths. Seven inches of depth may be achieved with repetitive harrowing and proper moisture content. 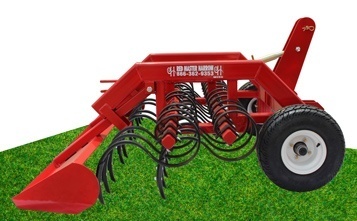 This harrow has also been successfully used in dirt rings such as barrel racing, team penning, reining, rodeo, etc. Cutter will adjust zero inches to 6 inches of depth, 7 inches with proper conditions.